Audience Given by the Trustees of Georgia to a Delegation of Creek Indians. by William Verelst, gift of Henry Francis du Pont, 1956. Courtesy of the Winterthur Museum. In 1734, General Oglethorpe made plans to return to London to report to the Georgia Trustees about the young colony’s status. Tomochichi, his wife Senauki, nephew Toonahowi (sometimes spelled Toahahwi), and a delegation from the Yamacraw tribe accompanied Oglethorpe on his voyage to Great Britain. The chief sought assurances that his people would receive education and fair-trade policies with the British. Oglethorpe, Tomochichi, and the Yamacraw delegation departed from Savannah on March 23, 1734, on the ship Aldborough. Tomochichi and the Yamacraw spent six months in Great Britain. 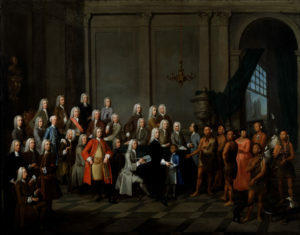 As part of negotiations between the Creek Confederacy (primarily the Lower Creeks) and Great Britain, Tomochichi and the Yamacraw delegation met with King George II, Parliament, and the Georgia Trustees. During their visit, the Yamacraw delegation also visited many sites in London and the surrounding countryside. 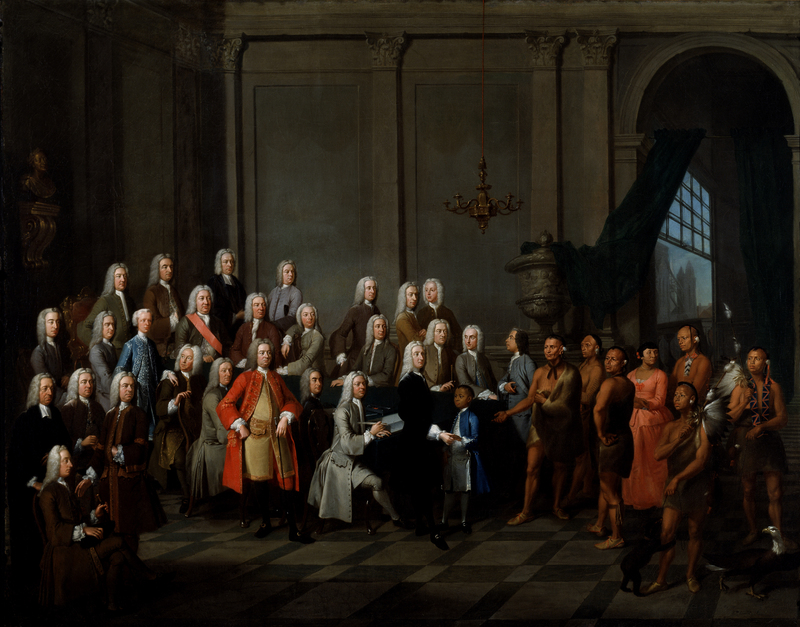 It was during this visit to London that Tomochichi and the Yamacraw delegation had their portraits made by William Verelst. He also painted the scene in which Tomochichi and the Yamacraw met with the Georgia Trustees. On December 27, 1734, Tomochichi and the Yamacraw delegation arrived back in Georgia on the Prince of Wales. Upon his return, Tomochichi met with Lower Creek Chieftains and convinced them to ally themselves with the British. While in Great Britain, Tomochichi and the Yamacraw delegation visited many different sites in London and the surrounding countryside. There were also several dinners and parties hosted in their honor. Explore the map below to learn more about the places the Yamacraw delegation visited and some of the highlights of their trip.